Incredibly Awesome Dill Pickles without canning! Bless their hearts, our neighbors gave me a ton of cucumbers yesterday-it must have been a bumper crop this year because after making relish, salsa, salad, and just eating them with salt, we still had a half dozen rolling around in my vegetable drawer. Don’t get me wrong, I love cukes, unfortunately, I am the only one in this house who will eat them, and really, how many gas-producing cucumbers can one person eat without ending up alienating the household? I thought about Dill pickles–everyone loves them. But long ago, I gave away my canning gear–no pots, no jars, no pressure cookers, nada. So I began my quest of searching for a recipe to make pickles without canning and incredibly, I found a way to make giant cukes turn into luscious kosher dills! 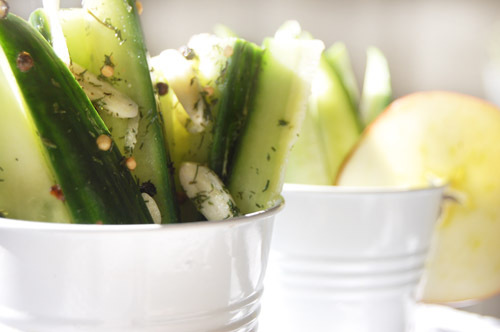 Cut the cucumber into spears, approximately 5 – 6″ in length. Place the peppercorns, coriander and mustard into a mortar and pestle and grind into a coarse mixture, just breaking open the pods and releasing their oils and aromas. Place the cucumber spears into a shallow baking dish or container, large enough for the cucumbers to lay flat, but small enough for them to be submerged in the liquid. Sprinkle the salt over the cucumbers, add the ground spices, dill and garlic. Toss to coat the cucumbers. Add the vinegar and water, and set aside for 30 minutes. To serve, remove the pickles from the brine and remove any excess dill or spices before plating. Reserve the liquid for storing leftover pickles in the refrigerator. Store in the refrigerator, in a covered container with brine, for up to 7 days. I have heard that you can also freeze them, so I will give that a try with any that we don’t use up in the next week. If anyone has tried freezing them, please let me know how it works! This entry was posted in dill, freezer, pickles, refrigerator. Bookmark the permalink.